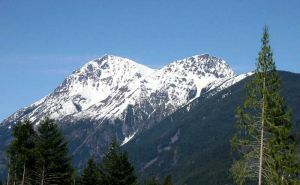 This peak is #44 in Prominence List for British Columbia .Birkenhead Peak is the great massif lying southeast of Birkenhead Lake, immediately above Pemberton Pass. It stands all by itself, and is surrounded by the deep valleys of Birkenhead Lake, Gates Creek (Anderson Lake drainage) and Blackwater Creek. A microwave tower access road rises high (almost to 2000m)on the northeast side of the Microwave Ridge sub-peak, and provides the usual access route. The only other named summit in the Birkenhead massif is Mount McDonald, to the northwest. Name Notes: Named after Her Majesty's Troopship "Birkenhead" which struck a rock off the coast of the coast of Africa on 26th of February, 1862, and one of the earliest examples of the British policy of "women and children first". As there was insufficient room in the lifeboats for everyone on board, the officers and crew bravely stayed on the ship, and many went down with it.